The Great Falls Historical Society invited young people throughout our community and beyond to step up to the research challenge: “Who are the ten players on the local 1890s baseball team?” as presented in a historic photo. 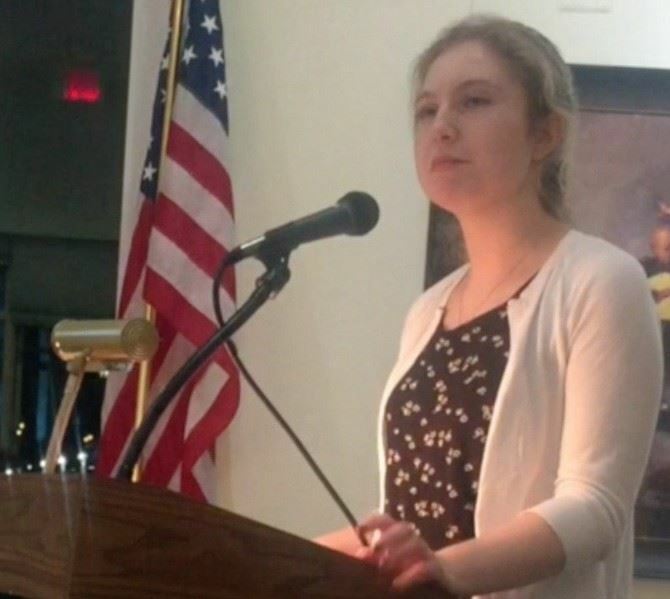 Caroline Ralston, a former GFHS Intern and current member of the GFHS Board of Directors, prepared an introductory presentation to identify the scope of the assignment, suggest research sources, and provide software suggestions that would assist with preparing footnotes and bibliography. Her presentation was filmed and her slides were shared on the Society’s website as an orientation for participants who might join in later. BRIAN LOVE, a senior from Walt Whitman High School in Bethesda, Md., was the first person to sign up. Ansley Bryan, an eighth grader from Flint Hill School in Oakton, was the only other person to complete the challenge all the way to the end. Brian lives in Bethesda, and Ansley, in Great Falls. Seven other young people agreed to participate in the challenge but dropped out along the way, some notifying of their conflict with sports or homework, others just silently becoming incommunicado. “I have several interests in addition to genealogy, these include baseball, politics, and music. I developed an interest in following professional baseball from my Grandma Love who lived in St. Louis. She was a massive Cardinals fan and would buy my brother and I baseball hats when we were much younger. She made me into the massive Cardinals fan I am today, listening to almost every game. I became interested in genealogy when I was in sixth grade when I would ask the questions: ‘Who were my grandparents and great-grandparents?’ This occurred in about 2011, but I did not actively research until a year or two later. Each summer I would purchase an Ancestry membership that would last about a month. In those short periods, I devoted all my time to research and added about 2,000 names each time. To this day, I have used Ancestry to trace my family to Medieval kings in England and France such as Charlemagne and Alfred the Great. Brian selected Howard Lester Cunningham to research. Virginia Rita is the manager of the Browns Chapel Methodist Cemetery where Howard is buried. She reported that she had no idea about the connections among the people at the Cemetery until she heard Brian’s presentation, which documents all the family relationships and interconnections. Brian located and interviewed descendants of the Howard and heard family stories about the role of baseball in their family over several generations. ANSLEY approached this project as a community service volunteer. Flint Hill requires community service hours each semester, but accepts volunteering on a research project in service to a non-profit organization an acceptable initiative. Ansley completed the genealogical research on one player and said it was so much fun, she wondered if she could take on a second player. She researched both Cornelius Taylor “Neal” Johnson, and Page Sanders. A descendant of the Page Sanders family was present, and was enlightened by Ansley’s excellent research. Brian will be attending the University of Pittsburgh in the fall and will major in Biology on a pre-medical track. Ansley will continue at Flint Hill School. Both presentations may be viewed at www.gfhs.org in the Gallery section. On May 24 the Historical Society elected its Officers and Board of Directors for next year. Outgoing President Kathleen Murphy received two rounds of applause and some nice flowers thanking her for her leadership the past six years. 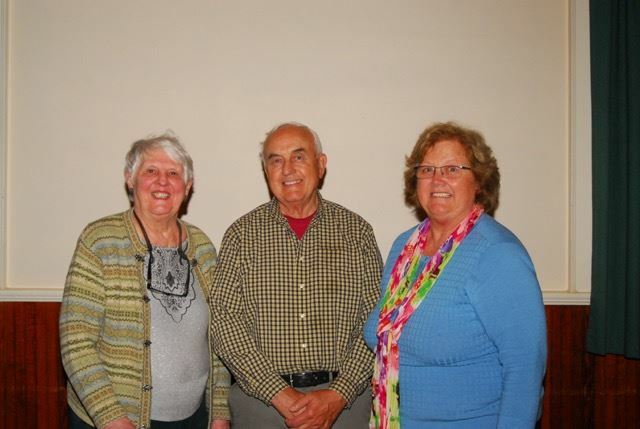 Incoming President Glen Sjoblom is pictured between Kathleen Murphy and Jackie Olin, also a past President of the Society. The newly elected also include Doug Cobb, Vice President and Treasurer; Betty Swartz, Corresponding Secretary and past Tibbetts Award Winner; Susan Kawmy, Recording Secretary, and Directors John Marciano, Hariett Destler, Karin Grasso, Janice Schar, Sondra Taylor and Katie Whitman. Around the table are Alex Brudno, Spencer Brudno, Caroline Ralston, Kathleen Murphy and her daughter, Mariaka Tsombikos. Karin Grasso, pictured separately, is the owner of the historic Jesse Smith house on Seneca Road. The Historical Society began 40 years ago; Programs begin in September, and the new Board plans to continue its tradition of inviting excellent history speakers, historical research, preservation and historic tours. Please join us! You can do so on line at gfhs.org. Friends gathered at the Great Falls Historical Society 40th anniversary, enjoying fine dining as each recalled their interest in history. Photo by TR Cook. The Great Falls Historical Society's 40th Anniversary--A festive celebration of community. 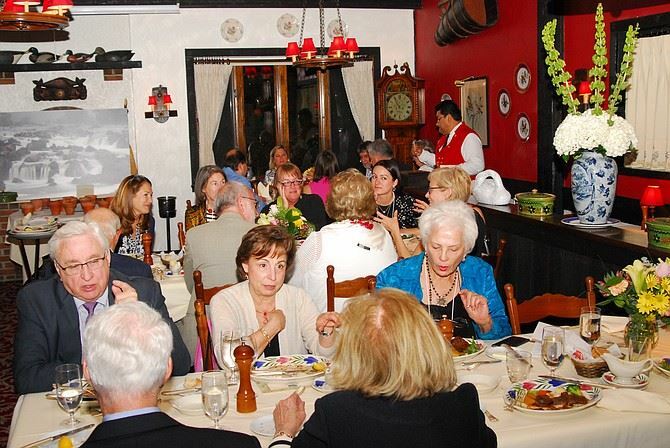 The 40th Anniversary of GFHS was a delightful gathering of members old and new who shared memories and hopes for the future as they enjoyed an exquisite cuisine, served impeccably in a classically decorated dining room at L’Auberge Chez Francois. 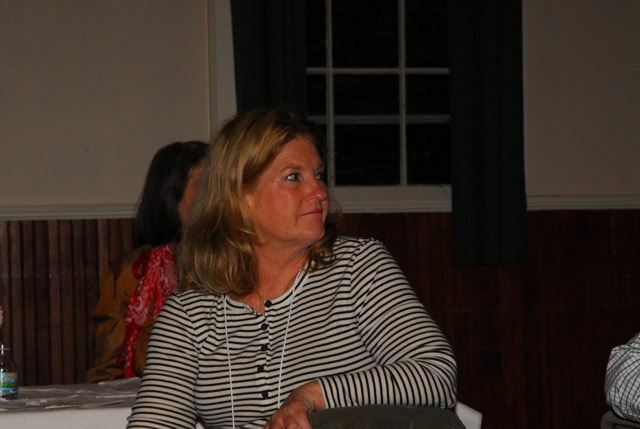 The Past Presidents who attended the celebration spanned the decades and included Genevieve Chadwick, wife of Bill Chadwick (1984-1986), Susan Cochran (1996-1998), Jacque Olin (2000-2002) and (2008-2011), and Calvin Follin (2003-2005). We received a thoughtful donation from Chris Osbourne (1994-1996) in honor of his mentor, Burt Brittin (1982-1984). The guest list included members from the distant past, and newly joined members. The dinner provided the occasion to get to know each other more fully. Photo by T.R. Cook. Members of the 2016-2017 Board present included Greg Haymans, Vice President; Betty Swartz, Corresponding Secretary; Doug Cobb, Treasurer; Sondra Taylor, 2013-2016 Director; and Jan Schar, 2016-2018 Director. Tibbetts Award Honorees present included Lucie Garrett, wife of Bill Garrett (2010), and Betty Swartz (2016). It was touching to see Calvin and Jennifer Follin exchange memories with Peter and Jennifer Falcone, both of whom had young children when they were initially involved with GFHS. At their table was Paul Jimenez and Elizabeth Wiley, parents of four young children, whose interest in history has just awoken. Our Society’s future depends on engaging young families in a love of local history. 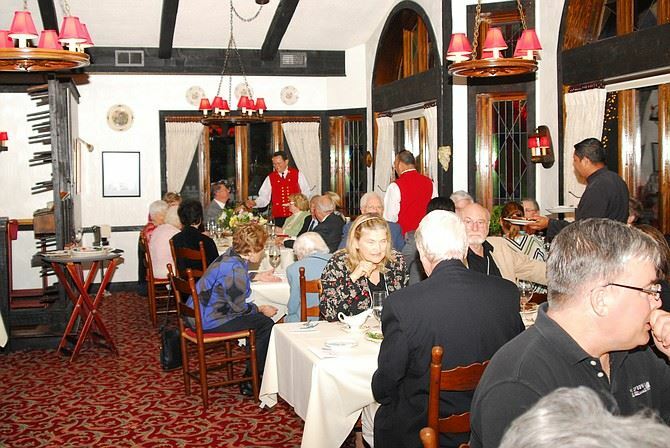 These lovely social occasions invigorate connections across the decades and inspire renewed participation. Jennifer and Calvin Follin, Jennifer and Peter Falcone, Elizabeth Wiley and her husband Paul Jimenez. 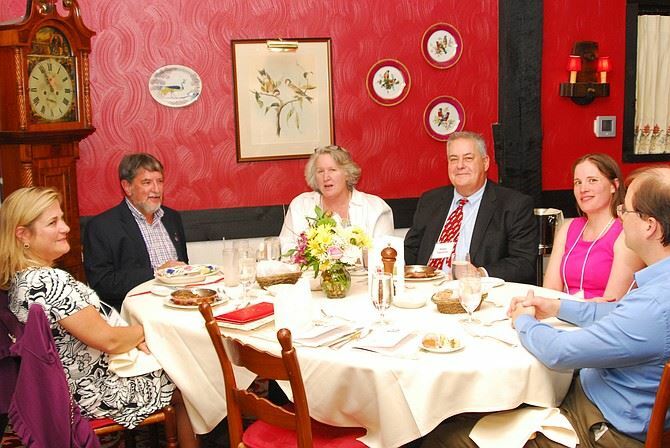 Calvin Follin was a Past President of the Society (2003-2005), Peter Falcone was chair of the Historic Preservation Committee in the late 1990s, and Elizabeth and Paul are new members. Photo by T.R. Cook. We are grateful to Doug Cobb, who chaired the Anniversary Celebration Committee and made all the arrangements. Alex Brudno did a remarkable job reaching out to local businesses to invite them to become supporters of our anniversary event. Twenty-five local businesses responded and showered our Society with thoughtful gift certificates and/or products and services they offer and/or even cash donations. 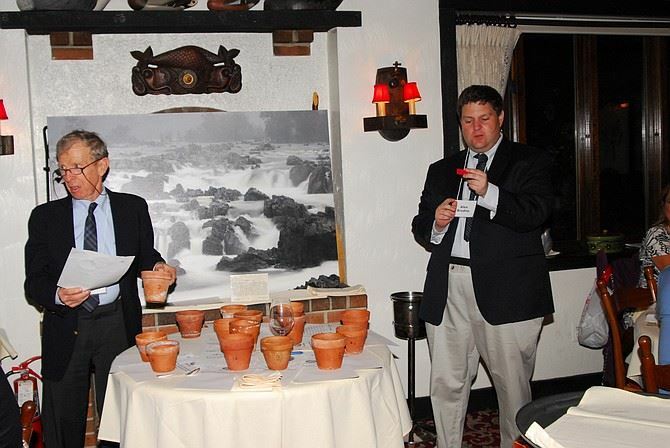 As each gift was raffled off, the donor was mentioned and their products and services were highlighted. Doug Cobb describes the gifts included in each raffle pot, while Alex Brudno pulls and call the winning number. Photo by T.R. Cook. We celebrate the story of our village and its continuing spirit of cooperation and caring. We are touched by the generosity of our local business community and sincerely appreciate their spontaneous giving to our society on the occasion of our 40th anniversary. 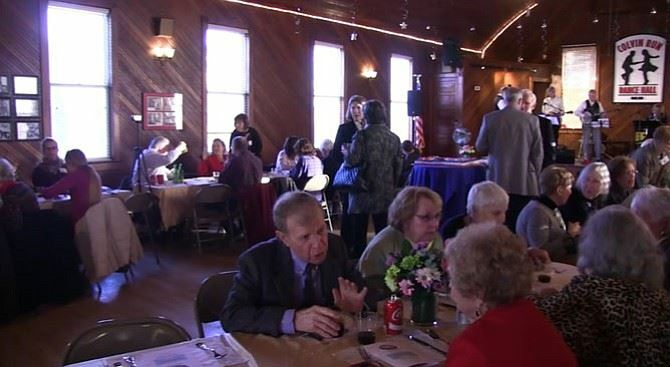 The Great Falls Historical Society celebrates 40 years. Forty years ago, just about this time of year, a handful of people expressed their interest in joining together to create a historical society for Great Falls. There was no handbook to advise on what to do, how to launch a society, what to research, or ways to inspire and unfold a passion for history in a certain direction. The organization blossomed through the willingness and enthusiasm of its members. It has been large, it has been small, it has focused on the 17th century, but also the 18th and 19th centuries. Those committing to doing history might have lived here for generations, or might have just arrived. Each person who has stepped forward to volunteer has offered their own personal gifts, abilities, and experiences, and have often been nourished and enriched through the process of cooperation and collaboration. The Society has also faced its limits and has confronted the limits of its members. Often in moments of deepest need, someone comes forward with the talent needed to advance once again. Naomi Whetzel made the photo exhibits. Dave Bettwy built the web site. Karen Washburn and Pat MacVeach told the story of historic houses through pictures, taking local residents on an armchair tour of historic houses throughout Great Falls. Burt Brittin and Bill Chadwick, being both former naval officers, recognized the extraordinary achievement of George Washington’s Pawtomack Canal and urged its preservation and protection. Bill Garrett and his son Ken were touched by their appreciation of the Pawtomack Canal history and visually presented a milestone article on the feat accomplished that has excited readers, and our members and neighbors ever since. Our members joined together to assemble a cookbook of 19th century recipes, before the time when there was a stove, filled with ingredients found in one’s backyard and garden. Jean Tibbetts was a wonder over more than a decade as she worked on the Publication Committee to bring writing projects to fruition. The award, in her honor, encourages members and others to continue the hard work of completing historic work. 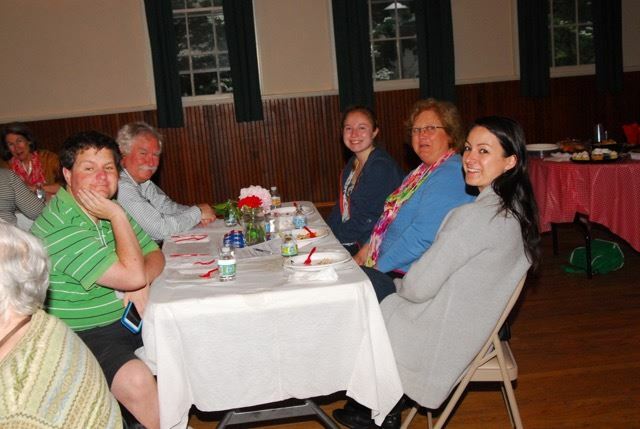 Our members loved to participate in potlucks which took place at the Colvin Run Mill, and The Dranesville Tavern, with a harvest picnic in October and a spring picnic in May, and an annual banquet each February at the River Bend Country Club. Beginning in the 1980s the longing for a place for our collection of photographs, maps, oral history interview tapes and documents of properties of Great Falls homes began. 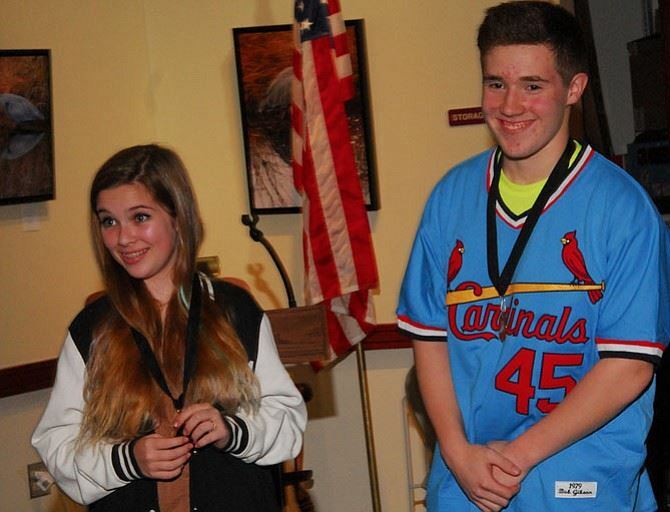 Many members have been engaged in sharing local history with local elementary school classes to “promote an understanding and appreciation of historic values and events among our students.” An exciting part of the year was conducting a speech contest for young people. Members joined together each year to prepare a historic calendar containing historic photos on a certain topic per year. A lot of research went into each theme. As the internet took shape and the promise of digitization arose, the idea of digitizing our photo collection was proposed at the time of our 20th anniversary – only to be accomplished close to 15 years later. Old school days, heritage days, grange and old school days, later to be called Great Falls Day, came into favor, as one-room schoolhouse reenactments were presented and historical exhibits were shared. Historic preservation has been supported and encouraged throughout our 40 years, most recently in support of the Resident Curatorship Program, being launched throughout Fairfax County. Just this past week, we received a note from Chris Osborne, our 10th President, who served from 1994 through 1996. He is currently living in Reno, Nev. He sent a donation in honor of the Society’s 40th Anniversary and sent a note that his donation was in honor of Burt Brittin, President from 1982-1984, as Burt was his mentor in his early days in our society. Having regard for the past, and a willingness to join with others in building a legacy requires respect for those who have come before us and an appreciation of their guidance. We have been blessed by Naomi Whetzel’s commitment to gather photos, TR Cook’s continuing commitment to capture images of our events, and the beautiful gifts showered on us by Archie Brown who added to our image collection with photos and video. As we move forward, we are sure to encounter other limitations on our combined talents and needs for expertise that does not lie within our midst. We appreciate those who lend a helping hand, as Carlos Berrios did last year, organizing our digital files for more efficient searching. Our work continues to build community spirit by bringing the past into the present – hoping that we will leave a legacy for future generations. 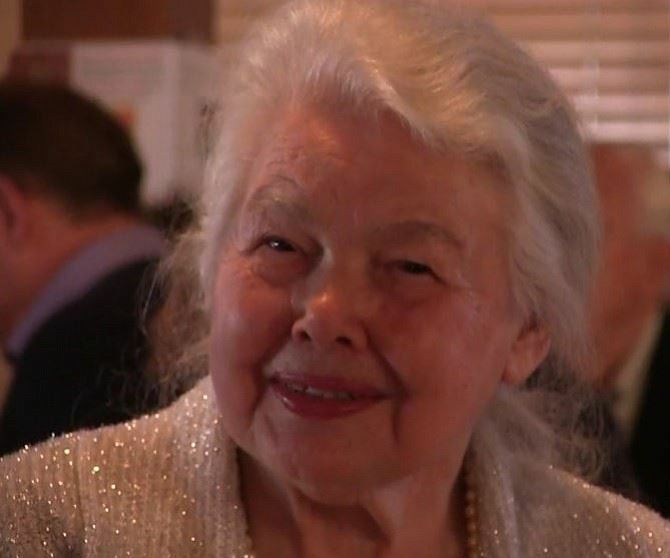 Great Falls — On Sunday, April 26, the Great Falls Historical Society gathered at the Colvin Run Dance Hall to present Doris Carpenter with the Jean Tibbetts History Award, acknowledging her achievements in educating the community about the many successes and challenges of Thelma’s Country Store. By researching, preserving artifacts, documenting, and telling the story of a modest country store over a 70-year period, Carpenter preserved an important piece of our community’s past for future residents of Great Falls to enjoy. 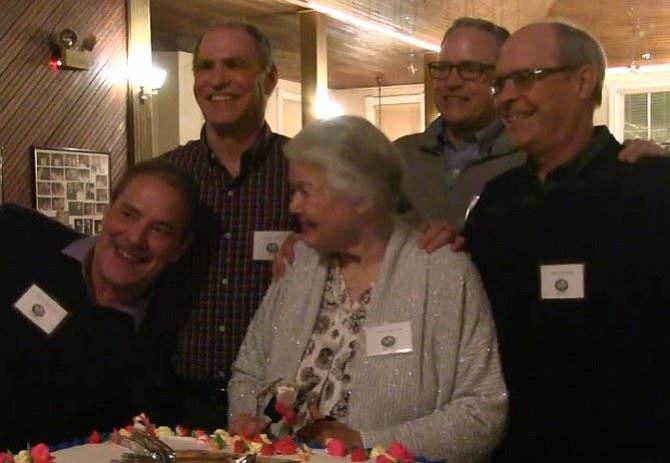 Those who came to honor Doris told stories of her leadership in 4-H, her work at the United Methodist Church, her efforts at the Great Falls Library, her digitization of the Naomi Whetzel Photographic Collection, and more. Dorris Carpenter with her four sons Lanse, Anson, Reyan, and Tris--four of her eight children. Doris's daughter Dea and her son-in-law Mike Shenk, were also present for the celebration. Six of Doris’ eight children were present – all proud of their mother. Walt Lawrence gave Doris a night-time photo of Thelma’s Store taken at a time when the store was still open, which he presented to her at the event. The Difficult Run String Band played the music, Our Mom Eugenia Greek Restaurant catered the food, and the Board of the Colvin Run Dance Hall offered the use of the Hall as a gesture of gratitude for Carpenter’s many years of service to the Colvin Run Dance Hall and nearby neighbors. Great Falls Historical Society colleagues and friends of Doris Carpenter joined in the celebration, as close to 60 guests filled the Colvin Run Dance Hall on Colvin Run Road. George Newman captured the spirit of the evening and of Carpenter very well. He noted that Doris had matured into a most beautiful loving and giving senior citizen — a fine example of how to age with dignity and grace. Having her wits about her to capture pieces of history as it was happening — capturing history as it was unfolding — is a gift to our community, and a piece of local culture. The Great Falls Historical Society is pleased to award the 2017 Jean Tibbetts History Award to longtime GFHS officer, member, and local resident, Doris Carpenter. This award honors an individual for their research, articulation, dissemination and preservation of history for the Great Falls community. Doris profoundly meets these requirements and was unanimously chosen by the Award Selection Committee. Doris moved to Great Falls with her husband and young family in 1963 and raised her eight children here in Great Falls. 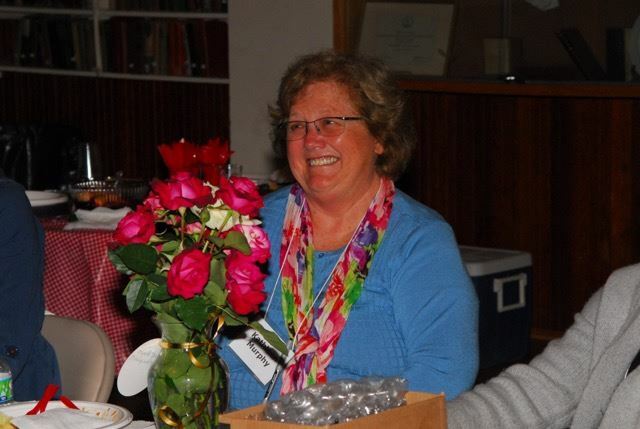 She has contributed in a wide variety of ways to the furtherance of local community spirit including being a leader in the 4-H Club, volunteering at the Great Falls Library, and serving as the Treasurer of the Women’s Group at the United Methodist Church, among many other volunteer efforts. With this award, the Great Falls Historical Society wishes to acknowledge Doris for her contributions to local history. Last June, Doris Carpenter authored a book on Thelma Feighery and her country store entitled, “Thelma’s Country Store: A Colvin Run Road Legacy.” The book contains photos of historical artifacts and of people, the store, and events, that bring to life the successes and challenges of being a country store over a 70-year period. Doris meticulously collected the various artifacts, realizing that she was close to the unfolding of an icon of great importance to the story of our community. She kept the past to share Thelma’s story in the future. Most people remember Doris assisting her friend, Thelma Feighery, at Thelma’s Country Store. Doris recounts her experiences at Thelma’s store in the book, sharing everyday interactions at the store over 70 years: 20 years when the Roberts owned the store, and the 50 years that the Feigherys’ owned the store. Originally on Leesburg Pike, the store location became Colvin Run Road in the 1940s, when the Leesburg Pike was relocated to its current position and the old Leesburg Pike was renamed Colvin Run Road. As one of 7 local stores that served Great Falls prior to the opening of Safeway and 7/11, Thelma’s was a local institution most fondly remembered for serving 23 flavors of hand-made ice cream to many of us. While helping customers in the store, Thelma and Doris maintained a personal warmth and sincerity that helped make Thelma’s a uniquely memorable and pleasant atmosphere, which is difficult to find today. Through all the devoted interactions with customers, Doris has the presence of mind to keep artifacts for history’s sake. It is thanks to her long-term commitment to gathering history that we have a story that gives a very real sense of what it was like to run a country store over a long period of time in the midst of profound cultural changes. Doris contributed in other ways to local history: She has dedicated much time to the Great Falls Historical Society, serving on the Board of Directors as Recording Secretary over many years, Publications Committee Chairperson. In this role, Doris saw to the republication of several local books many of which were sold by her at the local farmers’ market. Doris has contributed to the oral history collection and has organized programs such as Ghost Stories of Great Falls and Local Country Stores. Other work includes serving as Chair of entertainment for Great Falls Day, and leading the digitizing of local photos to create the GFHS Naomi Whetzel Photo Collection. Through these activities Doris has met or exceeded all requirements for the Tibbetts Award that we are so pleased to award her. The Great Falls Historical Society was formed in 1977 to build community spirit by bringing the past into the present. GFHS would like to thank Karen Washburn and Kathy Pherson for serving on the Tibbetts Award Selection Committee, assisting me in this important work. The Tibbetts Award Annual Banquet will be held on Sunday, Feb. 26 at 4:30 p.m. at the Colvin Run Community Hall. If you would like to join in celebrating Doris’s Award, you may reserve a seat at www.gfhs.org or mail in your reservation to GFHS, P.O. Box 56, Great Falls, VA 22066. Each ticket is $50 per person and, unfortunately, we are unable to accept payment at the door. The event will be catered and the meal will be a Banquet Buffet. Caroline Ralston gives presentation on Wednesday, Jan. 11 on how to find and use historical records to discover more about the lives of the players featured in an 1890 photograph of the local Forestville baseball team. A call to young historians: Join ‘The 1890s Baseball Team: "What History Reveals" project. Great Falls — My experience with the Great Falls Historical Society (GFHS) began the summer of 2015. I had just finished my first year at the University of Mary Washington and was looking for an internship to gain experience in my field of study. My love of history and archives led me to the Society, where I began an internship researching the history of Colvin Run, as well as some of the area’s historic homes for a National Register of Historic Places application. Completing my internship with GFHS not only made me feel more connected with Great Falls (I’ve lived here my entire life), it also exposed me to deed research, working with microfiche, and working with primary source documents. These skills were invaluable in my classes the next fall and truly strengthened my research skills. Getting real-world experience through this internship provided me with the confidence to apply for scholarships, and the connections I made while interning have really made a difference for me. When it came time for department scholarship applications in the spring, I applied for and received the Milton Grigg Northern Virginia APVA Scholarship by the NoVA Chapter of Preservation Virginia. I believe that the time I spent interning with GFHS the summer before was an important factor in my application that helped me stand out from others. Fast forward to summer 2016, when I was invited to join the GFHS Board of Directors as their Co-Chair of Communications, Public Relations, and Website. My time on the board has given me an inside look at how historical societies, and boards in general, operate. As Co-Chair of my committee division, I’ve worked with a webmaster to learn how to develop and maintain our website, and now, I keep the site up- to- date with our latest events, news, and research links. Our latest program, a research challenge called “The 1890s Baseball Team: What History Reveals,” has allowed me to share all of the skills I’ve acquired from my internship and from my classes in college with individuals who are interested in history too. On Jan. 11, 2017, I gave a presentation explaining how to find and use historical records to discover more about the lives of the players featured in an 1890 photograph of the local Forestville baseball team. This program, while open to anyone, is targeted towards middle and high school students to engage young people in history and introduce them to what GFHS is all about. It has been very fulfilling to engage in the community through programs like our baseball research challenge. I am incredibly grateful for the opportunity to intern with and sit on the Board of Directors for the Great Falls Historical Society. I look forward to continuing my work with the society and seeing what the future brings for our community. This 1890s Baseball Team challenge to make a player come alive through research program, while open to anyone, is targeted towards middle and high school students who have a genuine love of history. 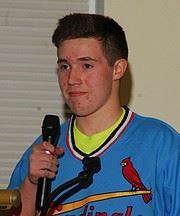 Four students have signed up so far - one from Whitman High School in Maryland who has been doing genealogy research since he was 6 years old; a, gifted one young man in sixth grade who loves history and baseball; and two others. We are reaching out to our community to identify six more gifted young historians who could benefit from a history challenge that will connect him with good research techniques and a lot of support from GFHS members and others devoted to local history. I know that participants will feel what I have felt - that engaging in the community through programs like our baseball team research challenge is a great learning experience that is fun and insightful. The young man who has been doing genealogy for years actually found some sources that he did not know about that will make his research much more productive in the years ahead. Caroline Ralston attends University of Mary Washington, Class of 2018, and is a member of the Great Falls Historical Society Board. The 1890s Baseball Team: Front row -- Neal Johnson, Tom Dickey, Walter Follin, Page Sanders, and Sidney Follin Sr., Back row -- Albert Cornwell, Howard Cunningham, Joe Money, George Gunnell, and Harvey B. Cornwell. Bringing a local player to life through history. Great Falls — At this time of year when family and relatives unite for that uniquely American holiday, Thanksgiving, it is not unusual to dig into the past to see how we all looked and felt and thought in the old days! 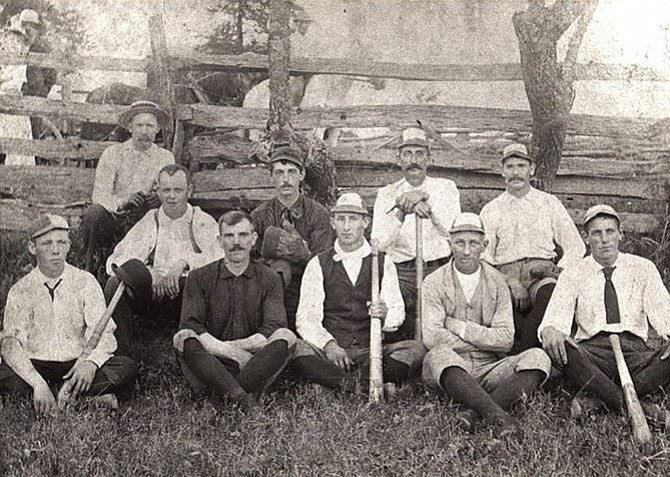 Take a look at the local 1890 Baseball Team, for example. The team was lined up in front of a fence that may have held their horses while they played. Four guys had bats, one or two guys had gloves, most seemed to be wearing riding boots. At least five were wearing the same type of baseball cap, apparently to show they were on the same team. (1890s Baseball Team, The N.F. Bradford, Sr. Collection, copyright Great Falls Historical Society). WHO WERE THESE GUYS? Many have last names that we still recognize today. The 1890s Baseball Team included, from left to right, (front row) Neal Johnson, Tom Dickey, Walter Follin, Page Sanders, and Sidney Follin Sr., and (back row) Albert Cornwell, Howard Cunningham, Joe Money, George Gunnell, and Harvey B. Cornwell. They came from families that owned farms in the area that we now know as Great Falls that may have ranged from 10 acres to over 1,100 acres. The automobile had not arrived yet, so they needed to get together by horse or by foot. Here is our invitation and our challenge to you: Please pick one player that you would like to know more about. (You can look up the 1860s historical map that is overlaid over today’s map to find out which team member might have lived on the land where you live today.) Let us know which player’s research team you would like to be on – or form your own team. Here is the research challenge: Can you make that 1890s player come alive through research? Where did the baseball player live? Who were the members of his family? What did his family do for a living? What was his life like in a typical week? What kind of education did he have? How did he travel to meet his friends for a game of baseball? GFHS will introduce you to others who are interested in working on the same research with you, if you would like. Or you can join a team of others with the same interest. Your team can meet once a week to report on progress and share what you have found, or you can set up your own schedule. Each team is invited to share the results of your research in an engaging manner: An engaging video? A re-enactment? A compelling display? The deadline for submission of the final work on each of the ten 1890s Baseball Players is Monday, Feb.15. The results will be presented at our March Program on Wednesday, March 9. Participants will also be invited to present the results of their research work and presentation to entire community at Great Falls Day in early May, 2017. Prizes will be awarded to the team that does the most thorough research on their players and who does the best job of making the 1890s baseball player come alive through an engaging presentation. TO JOIN or form a research team focusing on one of the players, please let us know about your interest by emailing The 1890s Baseball Team Committee at www.gfhsva22066@outlook.com or by calling Sondra Taylor at 703-759-6204. We are looking forward to learning about these baseball players who are part of our local past. As we reflect on the many journeys we have taken around the country and the world - whether by photos, film or airplane - memories of historic structures stand out, marking places as unique, special, and even remarkable. Historic structures speak to us and inform us about those who have come before us, creating a sense of place. On Oct. 15, 1966, the National Historic Preservation Act of 1966 was passed, encouraging our nation to keep those historic structures deemed national treasures in tact and to stop demolishing our most important historic and archeological sites. Over the last 50 years since that Act, residents of Great Falls have labored to gather the history and survey the standing structures, identifying those with structural integrity of national-treasure importance. They have added Four Stairs, 1737, The William Gunnell House, 1750, The Potomac Canal Historic District, 1786, The Colvin Run Mill circa 1811, The Georgetown Pike 1813, The Cornwell Farm 1831, The John Gunnell House 1852, The Forestville Schoolhouse 1889, and The Great Falls Grange 1929 to the National Register of Historic Places. Further, a Colvin Run Historic District 1880-1943, comprising intact buildings of historic significance along Colvin Run Road – the former location of the historic Leesburg Pike 1732-1943 - as well as the Colvin Run Road itself, has been deemed eligible to be added to the National Register of Historic Places. Further, Fairfax County has a List of Historic Sites of local significance that includes an additional 30 sites located in Great Falls. Knowing that those here before us built beauty and established economy makes us proud to live in a place imbued with meaning. “The past, when it was present, was a multi-dimensional reality. Today, we have only the bones that yesterday left behind on our plate. Let’s take the Great Falls Grange as an example. Between the time the Grange was formed in 1920 and the building was opened in 1929, the structure already had an impact on the imagination of the Great Falls community. During the years leading up to the Great Depression, local residents held fairs, bingo games and raffles to raise money for the building. Finally, the Grange members took out a loan for $7,500 to get the building built. They could not wait any longer to have a place to gather. Walking through the Great Falls Grange today, you can almost feel the Friday night chicken dinners, the Saturday evening dances, the Grange Hall meetings where progress along levels of virtue tied to the seasons guided member discussions and interactions. Over the years, the Grange became a place where the community gathered. There was theatre and music and community meetings, Great Falls Day and more. Since the Park Authority purchased the Grange in 1978, use of the Grange has slowly deteriorated as the Park Authority sought to charge fees to cover costs. They are now empty buildings that are rarely used. 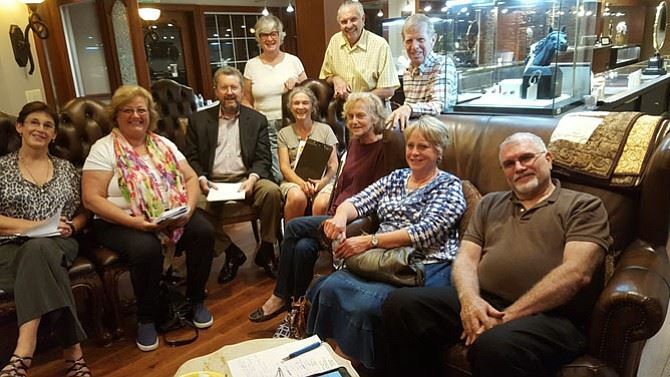 A new community group has just been formed this past Wednesday evening, Aug. 17, 2016 - The Great Falls Grange Project. Its purpose is to search for ways that the community might revive the historic Great Falls Grange Park, a historic district listed on the National Register, which includes the Great Falls Grange as well as the Forestville Schoolhouse. Looking at historic preservation from Brown Morton’s perspective, the question of this new entity needs to be, “How can these historic buildings be repurposed so that they contribute to successful human development in Great Falls, making the Great Falls Grange “a good place to grow good people?” How can we offer a “safe and healthy environment” where those who visit and engage part of their lives in activities within its boundaries can experience “dignity, celebration, shared remembering, and a sense of belonging”? The correct call for today is to take the historic structure and repurpose it in a way that honors and inspires our shared humanity – that calls us to a higher way of being. The commitment put in place this past Wednesday evening calls us to consider how to form a union that makes each individual entity meaningful and relevant within a larger caring for all of us together, with shared responsibility, shared concerns, and shared delights. The Great Falls Historical Society was founded in 1977 to “promote community spirit by bringing the past into the present.” This April 2017, GFHS will celebrate its 40th anniversary in service to the mission of bringing people together to gather and celebrate the history of this place where we all live together in community, Great Falls, Virginia. After 40 years of dedication to local history, GFHS has a birthday present request, indeed a challenge. Wouldn’t you like to give us a big birthday present? We challenge residents of individual neighborhoods within Great Falls to become historians, crafting the story of their neighborhood: searching the past, describing the realities of the present, and imagining its future. Go back as far as you can, but also come fully forward. Include the structures of yesterday, but also include the structures of today. What are the smaller and older structures in your neighborhood? What are the mega-mansions? What works, in terms of growing happy people, and what needs improvement? What is the story that you and your neighbors wish to convey about where you have come from and where you are headed that future generations might enjoy knowing about? On Jan. 11 and March 8, 2017, our monthly programs will focus on Neighborhood Stories – a portion of the program is open to any group within Great Falls who has prepared the history of their neighborhood. Participating teams will also be welcome to display their research on Great Falls Day on Saturday and Sunday, May 6 and 7, 2017 at the Great Falls Grange Park. Prizes will be awarded to the best research and storytelling presentations. We never know how our story might shape up or where our story might travel. Marge Gersic died this past July. She was an actress, and then a local advocate. Four years ago, she agreed to provide an oral history of her life, including her volunteer activities in Great Falls. 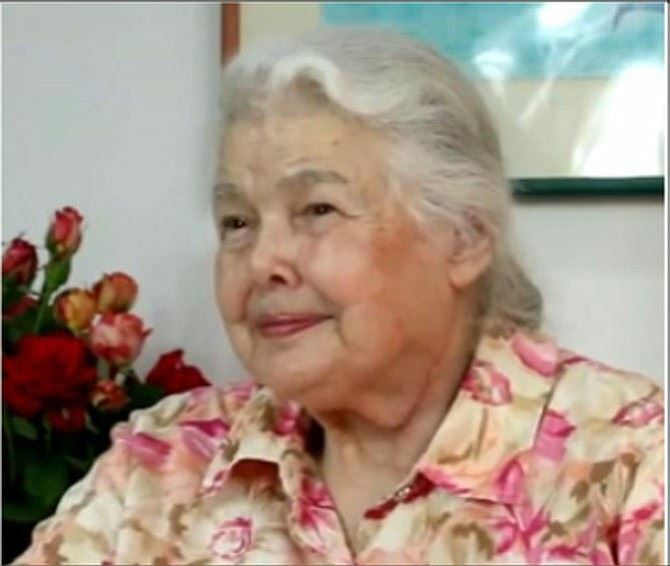 Upon her death, we are presenting her oral history on our web site. This is a chance for residents of Great Falls to hear firsthand how things used to be and listen to her willingness to play a part in making our community special through her committed actions, working together with others for the good of the whole. We did not know, when GFHS was founded in 1977, exactly what “promoting community spirit” was all about. With the call that Brown Morton has issued to go higher in our aspirations, repurposing historic sites to edify humanity today, we need to take a look at our neighborhood history so as to ensure that, in every way possible, we continue to make our neighborhoods throughout Great Falls, today, a good place to grow good people. It was such a delight for GFHS to participate in Celebrate Great Falls’ Fourth of July Parade. We were hoping that our entry into the parade would include a historic car or buggy, but things do not always turn out as planned. We are so pleased that Caroline Ralston and Alex Brudno showed up, (two University of Mary Washington history majors from Great Falls) ready to march with our historic sign (that we used to use when the Grange was available for community use a number of years ago) – and were willing to march in the parade on foot! The Great Falls Historical Society participated in Celebrate Great Falls’ Fourth of July Parade: Caroline Ralston and Alex Brudno, University of Mary Washington history majors from Great Falls, GFHS historic sign they used when the Grange was available for community use a number of years ago. Back on the Village Green, Greg Haymans and Nancy Christy were all set to lead people through the Great Falls Trivia Competition. The prizes were reall y great this year: Adults could win a $50 gift certificate to The Old Brogue or Katie’s Coffee, thanks to their generosity. Participants under 18 years could win a $50 gift certificate to EB Games. Many people played the game and all semi-finalists turned up to participate in the finals. Roya Lahmiri, sister of Parsa Lahmiri who won the competition last year, won the final competition and received her prize from Greg Haymans. 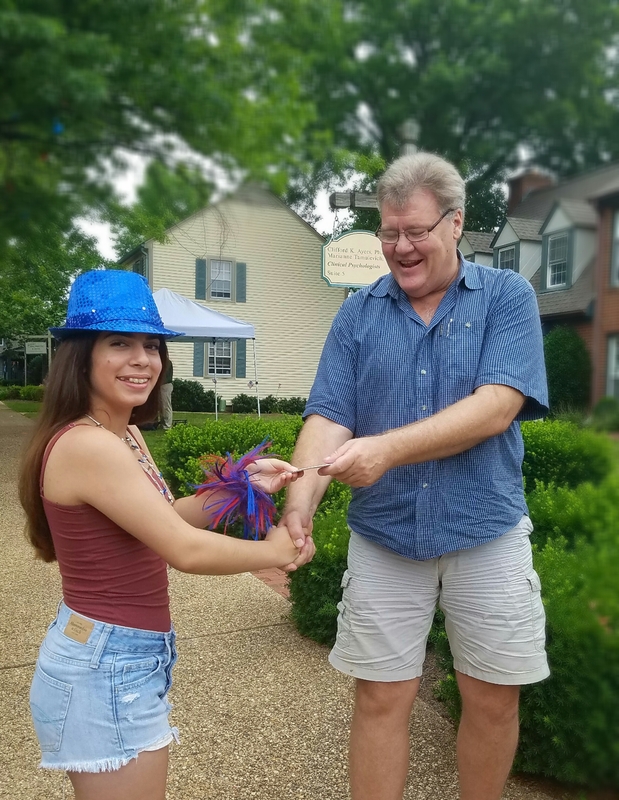 Roya Lahmiri, sister of Parsa Lahmiri who won the competition last year, won the Local History Trivia competition and received her prize from Greg Haymans. Kathleen Murphy, President; Greg Haymans, Vice President; Nancy Christy, Recording Secretary; Betty Swartz, Corresponding Secretary; Doug Cobb, Treasurer; and Karen Washburn, Historian. The Board of Directors includes: Caroline Ralston (2014-2017), Sondra Taylor (2014-2017); (John Marciano, 2015-2018, previously elected); (Carlos Berrios, 2015- 2018); Jan Schar (2016-2019); Jerry Santos (2016-2019).